The three Baudelaire orphans, Violet, Klaus and little Sunny, arrive at the Prufrock Preparatory School – only to be met by an unpleasant bully. And that’s not all. For in these pages, our unlucky heroes will also face snapping crabs, strict punishments, dripping fungus, comprehensive exams, violin recitals, S.O.R.E. and the metric system! i loved it. i loved how those 3 never fail to get themselves out of any trouble that they are in with count Olaf. 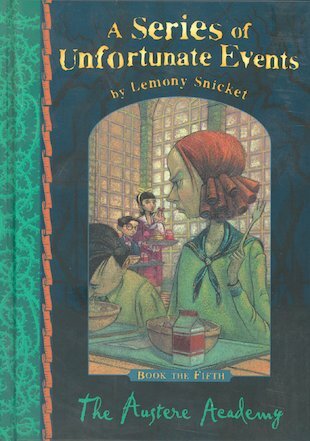 It’s a little strange how even though these books each have their unfortunate event they are really enjoyable, each page spent in anticipation of Violets inventions, Klaus’ knowledge and sunny’s Bites. this is the fifth in the series the poor orphans are sent to boarding school and forced to live in a horrible room and horrible children. The movie sucked, but the books are AWESOME! I watched the Movie I want to read the book.